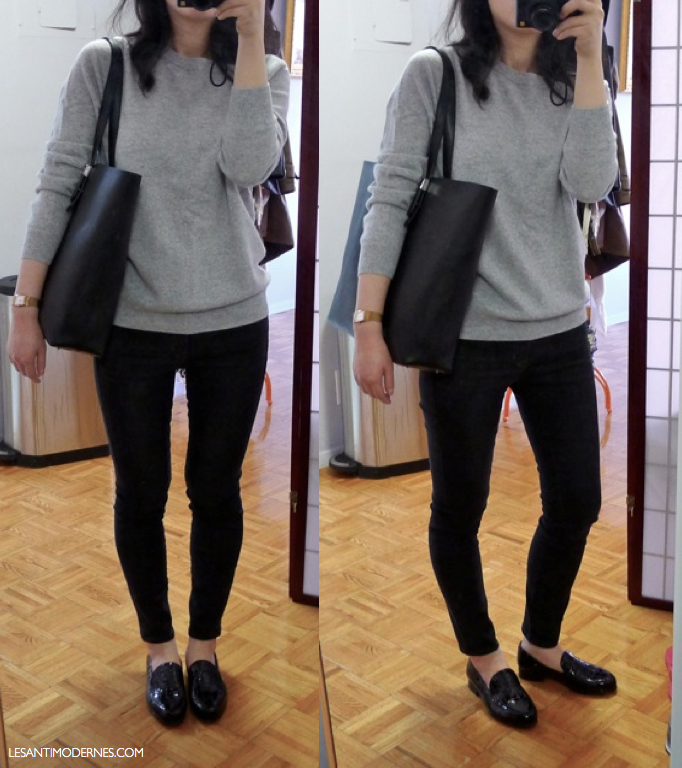 staying warm and comfy on a casual Friday with favorite grey cashmere pullover, go-to black skinny jeans, minimalist work tote (reviewed here), rose gold watch and dieppa loafers. what's been in your style rotation lately? - Is dry-cleaning a hard and fast rule for all cashmere? - How is this Everlane sweater holding up? - Should I size one up to get a loose "boyfriend" fit? I like that in your shot the fit is slouchy. It looks really comfortable. hi! wearing the S here. see my review on EL cashmere on sizing and care for more. i tend to dryclean but i also handwash with a cashmere shampoo; both are fine and there's been very little if any pilling on my EL knits. simply chic. the bag looks great. with the cooler weather, I've enjoyed wearing my (faux) leather pants. thanks P! very pleased with how my EL tote is breaking in. my two favorite cashmere's are pilled terribly - not from washing, more from super frequent wear. I think I'll check out Everlane's selection once I'm no longer in maternity. I've been wearing my black fur (faux) lined boots from Zara almost every day! I'm too much of a wimp to go without socks. have you tried a sweater shaver? they're quite handy for periodic knit maintenance. also, a sweater stone has come in super handy for my merino and cashmere blend sweaters. doesn't remove as much of the knit as a shaver. beautiful outfit! i wished i could wear regular shoes and ditch my winter boots. I just wanted to say that I always love all of your outfit posts, it's so refreshing to see such a simple classic style. Lovely and simple. I have the v-neck cashmere sweater in navy from everlane -- but now you are making me wish i had gottten the crewneck in light gray! They also have a new sweatshirt out that I want to try, but it sold out before I could get it. Supposedly it's being restocked so I will try it when it comes back. I have the french terry sweatshirt which is amazingly soft -- holding out to see whether it will eventually pill. I love black and gray. Always and forever! I look forward to the day when I can have bare ankles again. My Cole Haan loafers are beckoning, but for now I'm wearing my No. 6 ankle boots or Ugg Adirondacks over skinny jeans, button-down shirt, thick wool IM sweater, and my Barbour Bedale with warm liner. Based on how your Everlane cashmere sweater fits, I should probably order a medium, but I can't make up my mind. I love this look. Do you have the jeans in "coal" or "black out"? Do you find them true to size? So simply and so chic! I do a variation of this on weekend morning when I run errands. I just swap the jeans for my bespoke black trousers.